Regular readers of RGCD will probably already know about their r0x game for the Atari STE computer, released back in 2009. Simple, yet fun to play, r0x proved that a space themed action game doesn't have to involve shooting all the time to have a blast. 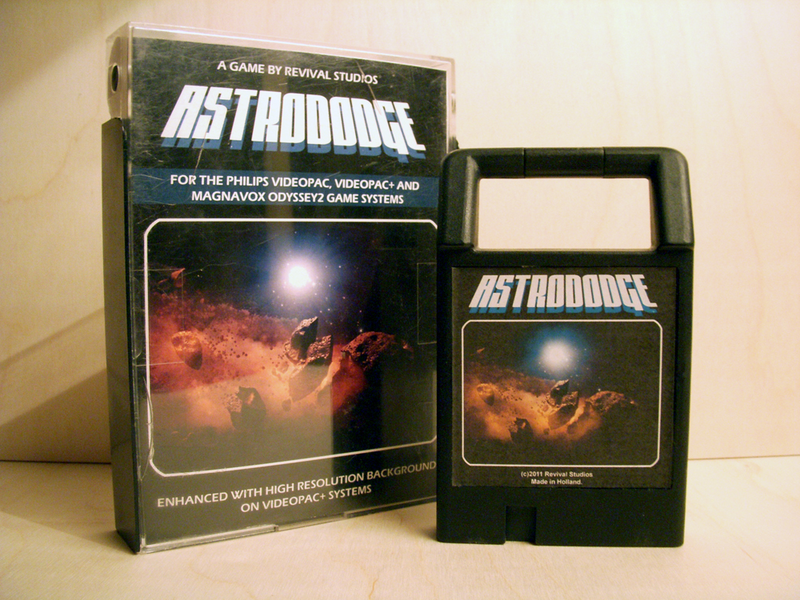 In fact, you don't have to shoot at all - a statement proven yet again in Astro Dodge, a new release for Philips Videopac and Magnavox Odyssey2 consoles by the Dutch based Revival Studios. The aim of Astro Dodge is to stay alive while flying through an asteroid storm, without being able to fire a single shot. By maneuvering the spaceship in all directions you try to stay out in the open, avoiding hordes of asteroids coming at great speed towards you. One wrong decision and it's game over. Unlike r0x there's no gentle difficulty curve here, it's challenging right from the start - and with only a single life at your disposal a game can be as short as a few seconds or last minutes depending on your playing skills. The gameplay is extremely simple, yet fairly addictive and has that important 'one more go' factor held by the classics of yesteryear. The main goal in Astro Dodge is to achieve the highest score, and developer Revival Studios have really put some effort into this, as it is possible to not only upload the score to the internet through a cleverly implanted unique code input, but also to get online rewards earned for performing specific tasks in the game. It is a nice modern feature and it allows you to compare your skills with players worldwide. Most games for the Videopac have been very basic looking, with no titlescreen and minimalistic graphics. Not so with Astro Dodge. This game comes with a nicely animated Revival Studios logo and a titlescreen, and while the asteroids look a bit lo-tech, much effort has gone into the design of the spaceship sprite, which for Videopac standards look very well-defined and colourful. The game is even prettier if you play it on the late Videopac+ G7400 model, giving you an entire playfield of enhanced high resolution background art to look at. And if played with a voice module, the game will let you hear encouraging speech sample every 100 points. Neither feature adds anything to the actual gameplay, but they improve the overall experience immeasurably and are impressive extra features considering the limited memory of a Videopac cartridge. Revival Studios had previously put a version of Astro Dodge as a bonus game on their Vectrex release of Debris, and even made the game for the less advanced Chip8 and SuperChip8 systems. The game mechanics of Astro Dodge seem to translate really well to these old systems. Maybe other consoles and computers will follow suit with their own version of Astro Dodge sometime in the future? I enjoy playing this game - it takes no time to pick up and play, but a whole lot of practice to master. Moving the ship left or right is actually enough to get through the asteroid storm, with little or no reason to move either up or down. After playing for some time, you reach a state bordering zen, where the game almost seems to play itself. The simplistic gameplay might be a turn-off for some players who are used to greater variation provided by more advanced 8-Bits, but for Videopac owners, this game is top of the line (and worthy of the shipping-inclusive 44 euro price tag). A cool new game for the Videopac in 2011. Revival Studios, I salute you! I bought a copy to play on my O2. Excellent presentation with good graphics, sound effects, etc. There's one huge caveat: the difficulty level starts off brutally difficult and never lets up. I have put a couple of hours into playing into this cart and have reached a high score of a whopping 218 points - and that was an aberration. Most games end after about 60 or 90 points.